Excellent infrastructure is inviting investment. DHL invested nearly $50 million in a new sorting facility in northern Kentucky that processes millions of packages each month. ypically, when one hears the word "logistics" in relation to Kentucky, it's in reference to UPS or DHL, both giants in the industry and each with a sizable presence in the state. A November 2013 article in The Economist asserted that the presence of the UPS Worldport at Louisville International Airport (SDF) created an "aerotropolis," an urban plan in which the airport is the anchor in further development, drawing new business and industry to the hub. The same could certainly be said of DHL's influence at Cincinnati/Northern Kentucky International Airport (CVG) as that hub continues to develop and expand. In fact, DHL Express, a division of global logistics company DHL, invested $105 million over the past four years enlarging its footprint at the airport. In June 2013, DHL unveiled its new 180,000-sq.-ft. sorting facility, which is designed to accommodate larger express shipments. Improvements also include an expanded ramp for wide-body aircraft, an employee and pilot building and technology upgrades throughout the facility. "The completion of the CVG hub is a further milestone in the continuous expansion of our international express network. We are growing, building for the future and providing U.S. companies with the logistics support they need to succeed globally," said Frank Appel, CEO of Deutsche Post DHL. Meanwhile, Louisville International Airport is home to the 5.2-million-sq.-ft. UPS Worldport, the world's largest automated package handling facility that sorts and processes an average 1.6 million packages daily. In addition to a capital investment of over $2 billion to build and expand Worldport over the years, more than 20,000 jobs are connected to the facility. Kentucky is quite simply a logistical dream, and the state's infrastructure - two thriving international airports and a network of equally capable regional airports, a system of active riverports, a major rail system and 19 well-maintained Interstates and highways - leverages its geographical capacity to maximum advantage. It's no wonder logistics companies of all sizes are choosing to locate in Kentucky. Transport Logistics International Inc. (Daher-TLI), the leading North American transportation management company specializing in radioactive material announced plans in August 2013 to expand operations in Kentucky by investing $2.2 million in a new facility in Ballard County, creating 20 new jobs. The new facility cleans and re-inspects large cylinders that are used to store and ship nuclear materials, a process that has to be done every five years. According to Mark Lambert, the company's co-founder and managing partner, Kentucky won the expansion for a host of reasons, beating out several other states including Ohio, Maryland, Tennessee and Virginia. "Logistically, Kentucky has a number of advantages," says Lambert. "We have the river right there in Paducah, so we use the river port for large shipments that go down to New Orleans and are sent internationally. It's also very centrally located amongst our customers. We can be on the East Coast the next day; we can get to the Gulf quickly. We have shipments going to Mexico and Canada. Kentucky is a hub for us because it's central, and the infrastructure is very good - roads, bridges and the river port. When we did our decision matrix, Kentucky came out ahead across the board in terms of workforce, incentives, location and the cost of doing business." Because the Daher-TLI facility would be processing nuclear materials, the company required state licensing. Lambert says the professionalism of Kentucky regulators eased the process. "The Kentucky regulators were very accommodating," he says. "They had a clear guide on what we needed to do and what had to be done. We were able to quantify, exactly, the cost and time frame for obtaining our license, which was a significant part of the process." "We believe there is no better city to provide such a compelling lifestyle environment for our employees who will relocate here." Workforce was another critical element in the decision-making process. Because western Kentucky already had a number of similar facilities Daher-TLI had no trouble locating workers with experience in the radioactive materials industry for the 20 positions they needed to fill. Lambert says they whittled down their list to two locations and finally chose Ballard County. "The folks there were receptive, eager and interested in us having our business there," he says. "We were on an aggressive time scale; they were responsive to our needs." Expansions of new and existing logistics companies in Kentucky are numerous. eBay Enterprise, an eBay Inc. company, is expanding the company's footprint in Louisville by investing $45 million and adding more than 150 new full-time jobs to the 500-plus workers eBay already employs. Plans include the joining of two buildings to create 270,000 sq. ft. of total workspace on 17 acres of land near the company's existing facility. Citing a "thriving workforce and vibrant community," Groupon CEO Eric Lefkofsky announced the opening of the company's distribution warehouse in Hebron. Groupon, an online marketplace, will use the warehouse in northern Kentucky as a fulfillment center for Groupon's flourishing goods business. The investment wil create 115 new jobs. XPO Logistics, a growing Connecticut-based company which initially had a small presence in Louisville, decided to expand its third-party logistics operation in 2013, investing $2.7 million in a new logistics center while creating 120 new jobs. A&R Logistics Corp. was bought by Louisville resident Richard Mitchell in December 2012. Within months came the announcement that Mitchell would move the company headquarters from Illinois to Louisville in 2013, investing $3 million and leasing 5,500 sq. ft. in a building on the University of Louisville's Shelby Campus. The company expects to create 50 new jobs and wanted a great environment for its employees. "We believe there is no better city to provide such a compelling lifestyle environment for our employees who will relocate here," said Mitchell. "We also believe strongly that Louisville will serve as an excellent source of new talent to bring into our organization." 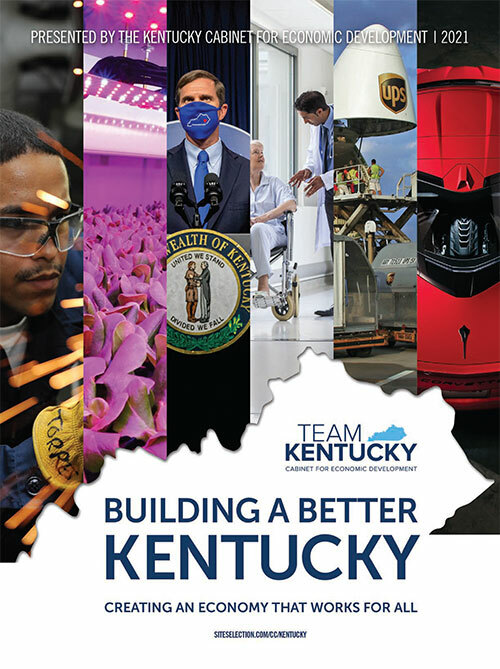 In just Kentucky-made products and services, exports exceeded $25 billion, a state record. Kentucky exports were up 14 percent over 2012, which is the second-highest percentage increase among the states. This doesn't account for products made elsewhere but transported through various companies shipping goods through the state's logistical infrastructure. The trends are clear - the logistics sector will continue to grow. Simply put: Kentucky is on the move. Over 1.6 million packages are sorted and processed daily at the UPS Worldport located at Louisville International Airport and then sent on to their destination by air and ground.